The early life of Charles William Williams is somewhat shrouded in mystery - in fact we know nothing of him or his parents until he joined the army. From his attestation papers we know that he was born in Yeovil in 1886 and on 28 November 1908, as a 22-year old working as a gardener, he enlisted at Bath, joining the 2nd Battalion, Somerset Light Infantry. His enlistment was for 'Short Service (All Arms)' meaning he enlisted for "7 years with the Colours, and 5 years in the Reserve, or, if the man completes his 7 years' service with the Colours while beyond the seas, then for a further period, not exceeding one year, with the Colours, and the remainder of the 12 years in the Reserve." His Service Number was 8757. In 1908 the 2nd Battalion, Somerset Light Infantry, just completing a 5-year home service posting, were sent to Malta where they were to remain until 1911. Charles presumably completed his basic training in England before joining his battalion overseas. In the 1911 census Charles was listed as a Private in the 2nd Battalion stationed in Malta. From 1911 to 1913 the 2nd Battalion was posted to China, before moving to India in 1913. It is assumed that Charles was with the battalion throughout this period. The 2nd Battalion remained in India throughout the Great War and it is thought that, at some point in time, Charles transferred to the Royal Garrison Artillery with the Service Number 33636. He was then transferred to 63rd Battery, 10th Brigade, Royal Field Artillery with the rank of Gunner and the Service Number 91169. 10th Brigade RFA, comprising 76, 81 and 82 Batteries came under command of the 6th (Poona) Division of the Indian Army. 63 Battery replaced 81 before the Division sailed for Mesopotamia. It arrived there in 1914 and saw service in the Tigris campaigns before being besieged at Kut-al-Amara. In April 1915, the Indian Expeditionary Force 'D', which had landed at Fao the previous November, began its advance inland with the intention of clearing Turkish forces out of south-west Iraq. Amara was occupied in early June and the advance continued along the line of the Euphrates to Nasiriya, and along the Tigris to Kut, which was taken on 29 September 1915. The advance to Baghdad was resumed on 11 November, but was brought to a standstill against the strong Turkish defences at Ctesiphon on 22-24 November 1915. By 3 December, the force, comprising chiefly the 6th (Poona) Division of the Indian Army, was back in its entrenched camp at Kut, where they were besieged by Turkish forces. Heavy casualties were suffered in desperate but unsuccessful attempts to reach the town and raise the siege in January, March and April. The garrison was forced to capitulate on 29 April 1916 and nearly 12,000 men were taken prisoner, many of whom later died in captivity. The Siege of Kut Al Amara (7 December 1915 – 29 April 1916), also known as the First Battle of Kut, was the besieging of an 8,000 strong British-Indian garrison in the town of Kut, 100 miles (160km) south of Baghdad, by the Ottoman Army. Charles Williams was wounded during the siege and died of his wounds on 23 January 1916. He was 29 years old. 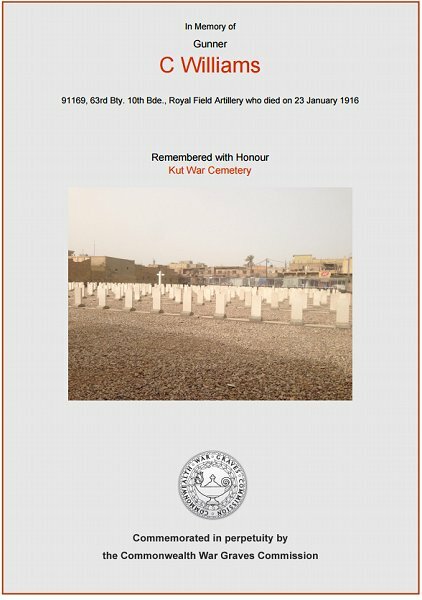 Charles Williams was buried in Kut War Cemetery, Iraq, Grave F7. His name was added to the War Memorial in the Borough in 2018. The Commonwealth War Graves Commission certificate in memory of Charles Williams.